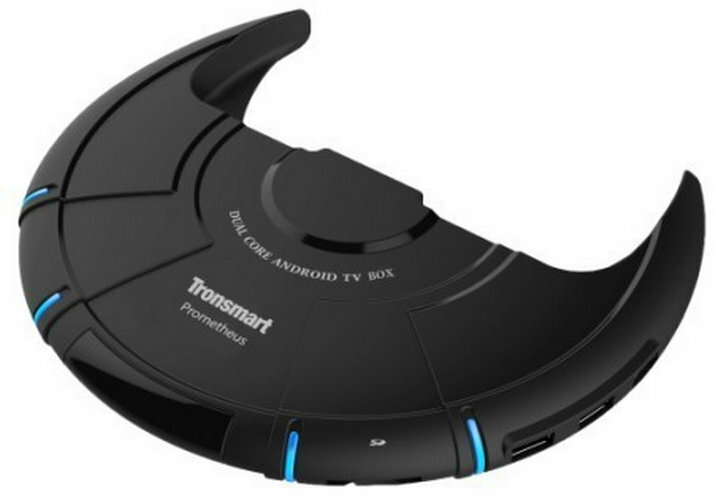 Most media players just look like a boring black or white box, but Tronsmart Prometheus proves it does not have to be that way, as this model comes in the shape of a spaceship. This box running Android 4.1.2 Jelly Bean is based on AMLogic AML8726-M6 dual core Cortex A9 processor with 1GB RAM and 4GB Flash. USB – 3x USB 2.0 Host ports. N.B: The specs mentions 3x USB outside, and 2x USB inside. But after a closer inspection of the casing and PCBA pictures, I can only shows 3 ports. The box is sold with a power adapter, a user manual, and a mini HDMI Cable. Tronsmart Prometheus runs Android 4.1.2, and some sellers claim it can support hardware video decoding with XBMC. You can buy it for $99 on Geekbuying and several Aliexpress sellers. The website http://www.tronsmart.com/ is mentioned on the STB package, but it’s still under construction at the moment. Via: Jorge on Google+ Mini PCs community. Yes! MK802 for less than $50! Oh wait… It’s based on Telechips TCC8920. Normally I hang with the tiny android tv stick crowd, but this thing is really cool. I’ve been looking for a set top box to replace my old ATV1 for XBMC. I ordered one of these hopefully it will arrive next week sometime. About the claimed two internal USB ports – I see two unpopulated groups of 4 holes in the board photos – one at the front near the IR receiver and the other at the top right, in between a chip and mounting hole. They might be USB ports… or might not. Also, the Wifi board appears to have four pins – I wouldn’t be surprised if it’s a USB device.